I am about to set off on a short break with @simonwatsonpt, two dear friends and a Sausage dog! To elaborate a little further, we're all going on a canal boat holiday in Llangollen, North Wales. 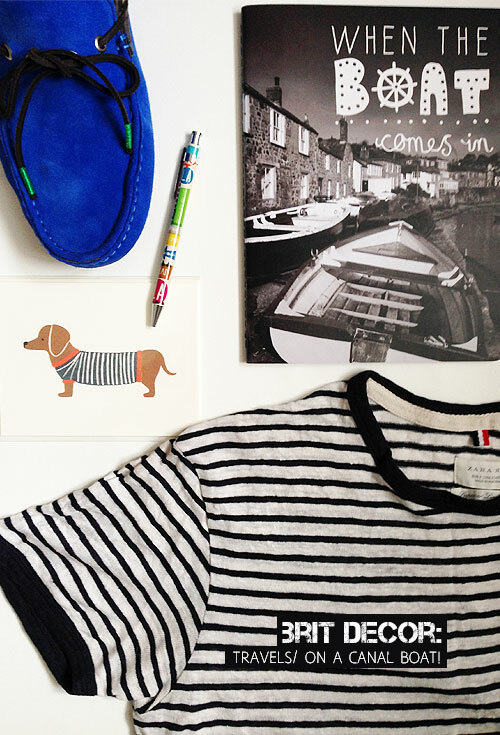 I have packed a selection of nautical striped clothing (how could I not?) plenty of my favourite navy blues and the famous cobalt shoes (Zara Man). There will of course be the obligatory boat themed notebook for jotting down inspiration (Paperchase) and I couldn't resist this cute little note card from Rifle Paper Co.
Apart from a brief day trip on a canal boat in 2013, I have no idea what to expect from this holiday. Between you and me, there are one or two reservations playing around in the back of mind, not least 'will there be a phone signal?' but hey, signal downtime is not always a bad thing. Because of the remoteness of this holiday destination, I'm going to have to face the challenge of shifting down a gear and quite literally letting the world sail by with oodles of time for relaxing, eating and friendship, which can only be a good thing. So I'll do my best to post some holiday pics and updates via instagram depending on my phone signal, and there are one or two exciting posts coming to these pages whilst I'm away.